Gregory A. Booker, as a Minister of the Prophetic Word, pens a remarkable work speckled with gems of wisdom and insight in Inspired Writings of a Prophet for Jesus the Christ. Resonating with the trying times, Booker shares his prophetic letters with the genuine intention of awakening the earnest expectation and blessed hope of Christ return for his Church. In his book he issues a greeting to the ministers of the churches and the congregation at large. He states “ The Word is declared and the moment has been established. For this is the times of restitution bringing forth the coming of our Lord and savior Jesus Christ. For if the Apostles can declare it then...why with all we are made to see cannot we declare it now! By the grace of God, there is one who works in the “office of a prophet” in the House of the Lord. The Lord has found him one who is determined to speak the prophetic word of God. For I am commanded to publish these words before the congregation. That they may know and I pray they may have belief in the ways of the Lord. The illuminating read of these four letters of prophetic utterances represents a condensed version of Booker’s earlier work, the “Seven Letters Detailing the Prophetic Framework of the Return of Christ”. It can be considered recommended reading to the Institution of Christianity regardless of denominational setting or national/racial heritage. This book also shares Booker’s personal experience in coming to know the Lord including other articles of encouragement in living the christian faith. 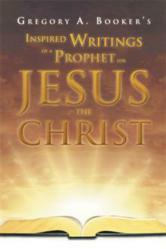 With Inspired Writings of a Prophet for Jesus the Christ, Booker encourages readers to approach God’s word with a fresh anointing of wisdom, knowledge, clarity and hope in preparation of Christ our Savior calling up His Church and the Messiah coming down to redeem Israel the Nation....at last per the scriptures. Gregory A. Booker, has studied eschatology for over 20 years and has received a certificate of ordination from Ministerial Seminary of America (MSA). He has also authored “Seven Letters detailing the Prophetic Framework of the Return of Christ”. Currently ministers the prophetic word in the city of El Paso TX through his Back to Basic’s Gospel Ministry. Blessed with wife Dilma and 4 children.